Following the embankment surveys that were carried out in 2017, we are progressing two phases of vital embankment works on the Union Canal at Linlithgow, as set out in our Asset Management Strategy. Phase 1 embankment improvements have been completed, as the new towpath has been constructed and is open to public access. Phase 2 works continue and are due to be completed on Monday 25th March. Due to additional construction activities that are required, including the installation of services and a towpath upgrade, the towpath closure at Bridge 45 next to Linlithgow Academy at Preston Road and Bridge 48 at Woodcockdale will be extended until Friday 15th March. The towpath is currently closed for maintenance between Manse Road and Bridge 41 (The Park Bistro). Please follow the diversion route.as shown on signage. Phase one works have begun and phase two of the embankment improvements will commence on Monday 14th January 2019. These works will involve further sheet piling at Manse Road East and will also run for 14 weeks. Navigation at this stretch of the canal will be closed during this time. The first phase will involve installing 160 metres of sheet piling between Bridge 45 next to Linlithgow Academy at Preston Road and Bridge 48 at Woodcockdale. Works will begin on site on Monday 5th November 2018, lasting for 14 weeks, with the towpath closed from this date to allow plant and machinery to access the canal bank. A towpath diversion will be in place for pedestrians and cyclists during this period, which also includes the two weeks over Christmas and New Year. The diversion is as shown in the map below, and runs via Golfcourse Road, Braehead Terrace, Braehead Place, Braehead Road and Preston Road. Navigation will be closed from Thursday 8th November 2018 to enable a partial dewatering of the canal as the channel will be closed by dam structures at both Preston Road Bridge no45 and Woodcockdale bridge no48. 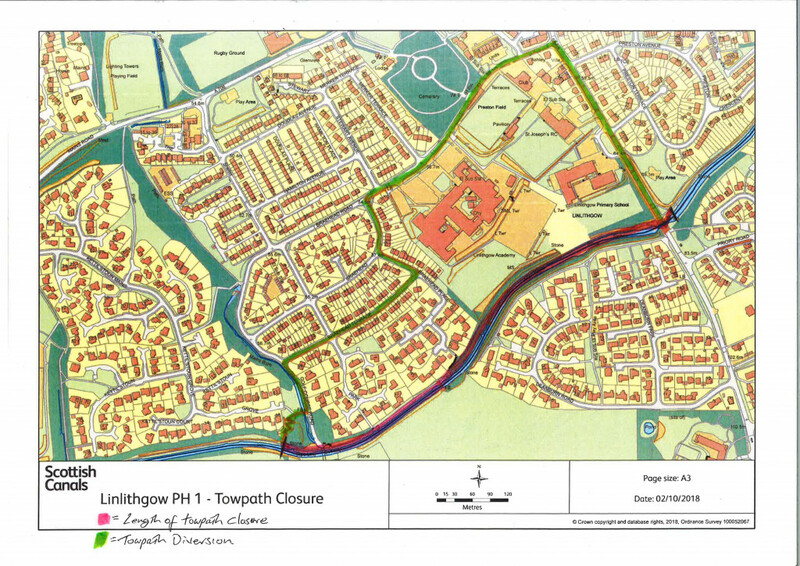 In addition to strengthening the canal embankment, these works will also create four residential and four leisure/visitor moorings at Linlithgow for which full planning permission has been granted. Follow us on Twitter @ScottishCanals for updates.